A great new tool for both family entertainers and mentalists. You can use this EVEN if you have never made a balloon animal in your life. One of the effects doesn't even use real balloons! Until now, there have been few ways to tie in your magic with balloon sculpturing. Imagine having a child or lady secretly think of a balloon animal and the color she would like it. You reach into your balloon bag and AMAZINGLY take out the color she has in mind, you twist it into the animal she secretly selected! Your participant will have no idea how you were able to correctly KNOW both the balloon animal and color. Picture doing this at a birthday party with all the children just secretly thinking of the balloon animals they want. Balloon Detective allows you to do this easily - without the children ever telling you the balloon animals they want. This effect will give you a BIG advantage over your competition in the kid-show market. Almost all birthday performers offer balloon sculpturing. You will be different. When a mother calls about a birthday party, you can say in my show, the kids just secretly think of a balloon animal they want and I make it for them. This not only sounds novel to the mother, but completely impossible. You will find in most cases, this will give you an advantage over other balloon artists in your area, and you will get the bookings! 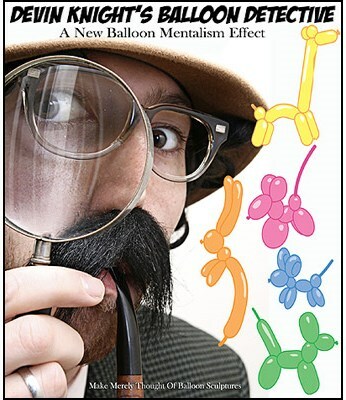 INFLATED THOUGHTS- Bonus Mental Effect: You can use Balloon Detective, even if you do not make balloon sculptures. A lady thinks of a balloon sculpture and the color of the balloon. You pick up a piece of cardboard, turn your back, and draw something on it. You turn back around keeping the drawing concealed. You ask her to tell you the balloon sculpture and chosen color. You show your drawing - it is a sketch of the selected sculpture drawn in the chosen color! PERSONALITY BALLOON- A very novel way to tie this effect into cold readings in which you end by making a balloon animal based on the client's favorite color and animal. Complete with four balloon menu-cards and directions explaining every nuance of this effect. Easy to do and the balloons sculptures are so simple that even a rank beginner can make them. THERE ARE 10 DIFFERENT BALLOONS ON THE MENU-CARDS. The directions also give you FREE on-line links to free videos you can watch to learn how to make any balloon on my menu!! !